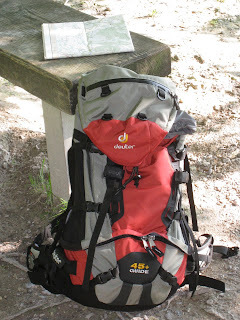 South Downs Way walk from QE Park & New Rucksack testing! The need for an excuse! I needed a half decent walk as an excuse to test out my new Deuter 45+10 Guide Rucksack so after a night of planning and pouring over numerous OS Maps to find a circular route around 8-9 miles I settled on a loop from Queen Elizabeth Country Park, along the South Downs Way and then back to the park skirting the edge of West Harting Down and onto the Staunton Way. That was about it in terms of planning to be honest, drive to QE Park and then start walking - simple! I put a bit more in the bag that was necessary for this walk as I wanted to test it out with a bit of weight to it. I'd bought it for the Mountaineering course that I've booked over Christmas but its actually the ideal size for use on a long day walk. 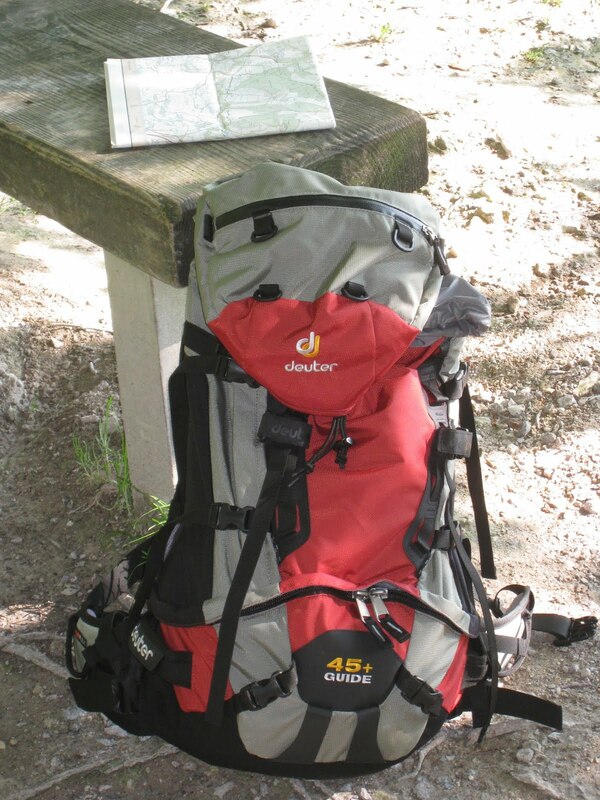 The North Face 25L and Osprey 70L sacks are too small and too big respectively for some trips (yeah ok, so its an excuse but I'm sticking to it!). 8am saw me in the, fairly quiet, car park of QE Park - no wind and around 18C, shaping up to be a nice day. I had to use my old faithful Berghaus GoreTex boots as my Meindl boots are away being repaired - this brought another testing element to the walk as these boots are 15 years old now and I needed to make sure they'd withstand a decent walk just in case the Meindl's aren't repaired in time for my 2 day walk in the Lakes later on this month! From the main QE park car park you head south initially before joining the South Downs Way (SDW) and heading North Easterly - this path then joins the Hangers Way and you follow this for a few kilometers before swinging around to the right and a short section of road by "Faggs Farm". 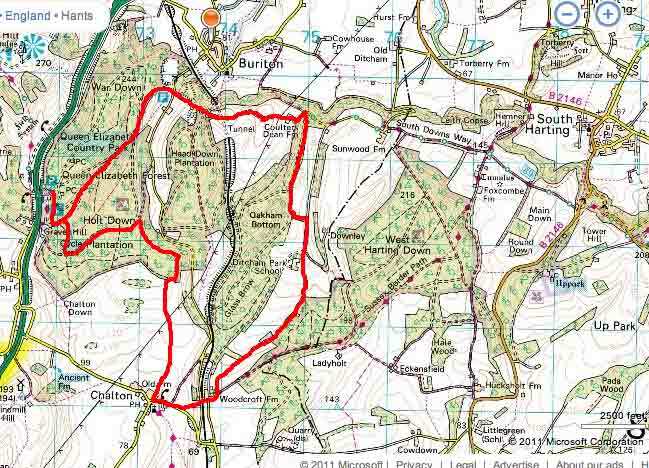 Head down the road for about 1k passing the chalk pit and Appleton's Copse on your left and then Dean Barn on your right. 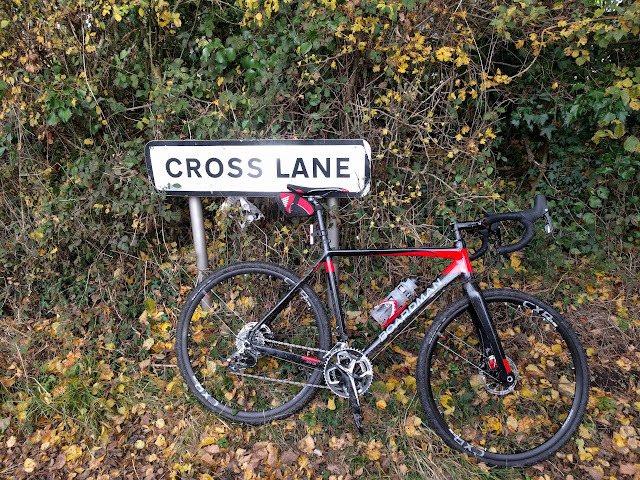 After about 2k on this small track/road you come to Coulters Dean Farm and a short section of tarmac road before turning right (almost due South) and down through the fields towards Oakham and Oakham Bottom. The path then turns left (across a field) and right as you head towards the very grand looking Ditcham Park School. Stay on this path for around 3k, passing the school on your right and then Park Barn (and woods) on your left until you cross through the middle of a large corn field and head down towards Woodcroft Farm. When you leave the path after Woodcroft Farm there is a road running left to right in front of you and more farm buildings directly ahead over the road. On the left the road is signposted back up to Ditcham Park School. You need to cross over this road and walk through the farm courtyard (stables on your left) and up onto a grassy bank that looks like its a dead end. At the top of the bank there is a small, overgrown, path - head through here, round to the left and you'll come across a set of steps that takes you up onto the railway bridge and down and back onto the path. Follow this path until you hit the road and carry on, down the hill, past Manor Farm on your left until you see a sign on your right for "Footpath" and "Staunton Way". This path leads, after about 2k, to the edge of Queen Elizabeth Forest and you just need to keep following the track until you see a sign, and path, to your right for the Staunton Way. 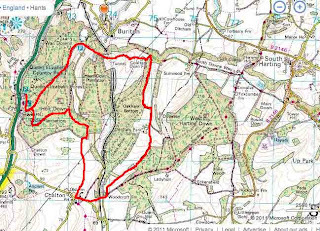 This wil lead you back around to the car pack where you started - 8.5 miles all in all and on the day I walked (24th July 2011, 8:30am) I saw 2 other people and that was only right at the end! So, how did the new bag fair? Really well, although I would have been really disappointed if it hadn't! Its odd getting used to a bag that doesn't have a plethora of pockets - but then its designed for Apline use and will serve that function well. The fabric is really tough and waterproof and the access pockets are easy to get to with taped zips on the top pocket - a nice touch. There are loads of loops and attachments for axes, poles etc and while not needed on today's ride the hydration compatibility did come in handy and routing the hose of my Platypus bladder was easy and unobtrusive. So all in all a really good, comfortable bag and the air-flow system kept my back dry despite 22C heat - can't wait to test it properly in the Cairngorms this winter!